Replace the former residence with a new 2-story residence and a garden guest-cottage. Link interior spaces and provide ample indoor-outdoor access and views. The double-height living room serves as a spatial hub, linking all interior and exterior spaces: entry, dining and kitchen; the loft above; and the front and back gardens. A trellised deck parallels the glazed master wing hall, linking the interiors to the south-facing courtyard and the intensively cultivated food and flower garden. The stairway and loft, both constructed with Douglas-fir planks reclaimed from an old lumber warehouse, lead to two home offices, an airy dance and yoga room, and to the covered ‘Romeo & Juliet’ balconies perched over the gardens. Despite the property size limit, the open-plan design results in spacious, airy and daylit interiors, with multiple links to the outdoors. Compact Footprint: The small urban lot is efficiently in-filled with the main house, a family guest cottage, and a small intensive, food producing garden. Reclaimed Wood: The mezzanine deck and stairs were constructed of massive reclaimed Douglas fir warehouse shelves. High-school gym bleachers were milled into window and door trim. 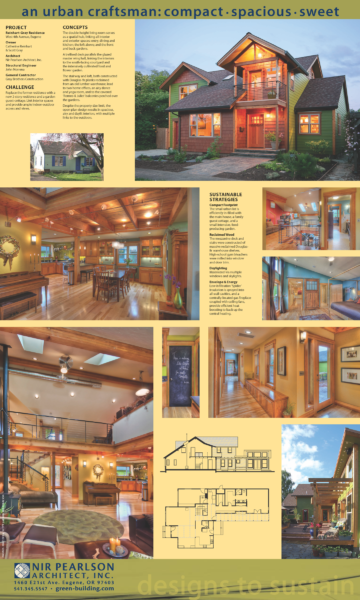 Daylighting: Maximized via multiple windows and skylights. Envelope & Energy: Low-infiltration ‘Spider’ insulation is sprayed into all wall cavities, and a centrally-located gas fireplace coupled with ceiling fans, provide efficient heat boosting to back up the central heating.